Activity/Unit: Notan Collages - "Expanding the Square"
Examples are from Madison Middle School - Larry Prescott Teacher. Designs can be symmetrical, asymmetrical - simple to complex. All are pleasing. Also good lesson for organic shape/biomorphic shape - geometric shape. Introduction to Notan, the Japanese word for the interaction between dark and light. Creating a black and white collage out of a simple square, and learning about positive and negative space. 1. To learn about Notan. 2. To learn about positive and negative space. 3. 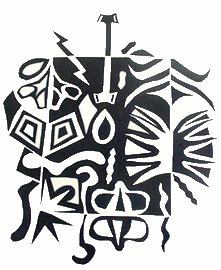 To use a simple square and all the negative cuttings to create a collage, which will inspire a mask. 4. To understand about symmetry and asymmetry, and the Principle of Design, Balance. 5. To understand the Elements of Art: Space and Shape (Positive and Negative). Good design has a balance of light and dark. Using the Notan concept of light and dark enhances design. Craftsmanship is essential to good design. Standard 1: Students will actively engage in the processes that constitute creation and performance in the arts and participate in various roles in the arts. Standard 2: Students will be knowledgeable about and make use of the materials and resources available for participation in the arts in various roles. Standard 3: Students will respond critically to a variety of works in the arts, connecting the individual to other works and to respond to other aspects of human endeavor and thought. Standard 4: Students will develop and understanding of the personal and cultural force that shape artistic communication and how the arts in turn shape the diverse cultures of past and present society. 1. Creation of a Notan collage. 3. Looking at and discussing Notan collages. 4. Understanding of Japanese Notan a guiding principle of Eastern art and design. 1. Discussion of PP of Notan examples. 2. Demo of collage creation, creation of rubric. 3. Independent work on collages – students make 2. 4. Artist Statement & grading of art. 2. White Drawing Paper , 12 x 18 (30.5 x 46 cm), Construction Paper > cut to size 5" x 5", (12.7 x 12.7 cm) Elmer's Glue , xeroxes of rubric. Segment 1: Discussion of PP of Notan examples. Guided Practice Use PP presentation to introduce the principle of Notan and the collage project. Segment 2: Demo of collage creation, creation of rubric. o Fold paper in half once (either diagonal or rectangular). 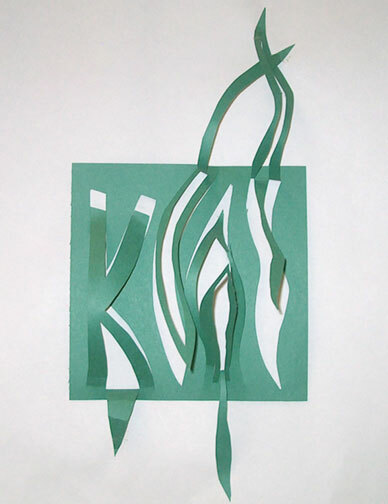 o Cut pieces out and arrange on a larger piece of white paper – ALL PIECES MUST BE USED. Discuss ways to cut smoothly and easily. o Discuss Balance and Symmetry throughout demo. o Give out paper clips and envelopes to save pieces – no pieces are to be glued until everything is cut and arranged. o Next class, demo gluing, emphasis on NEAT. After students have worked for a class period, develop rubric with students. Segment 3: Independent work on collages – students make at least two. Independent Practice After rubric is made, class critique, then finish collage. Students make 2 collages, choose one to grade. Segment 4: Artist Statement & grading of art. Guided Practice Go over Artist Statement, it’s uses, format, organizer and rubric. Independent Practice Students begin work on Statement in class, finish for homework, 2 days time. Find examples of "Notan" (balance of light and dark in fine art). Read the article by Sharon Himes, "Notan: Design in Light and Dark". Find examples of art you admire and change them to high contrast photos for illustrative purposes to show how the artist has balanced light and dark. Examples in the article may not be suitable for your student population. Have students look at and discuss the examples you present. Challenge them to find more examples (on line or in their text books). This extension will address National Standards 4 and 5 more in-depth. "Notan was a term lifted from the study of Japanese design by Arthur Dow. A book written for art educators using Notan as a major concept was popular in the early 1900's and influenced artists and teachers like Georgia O'Keeffe." ~ Woody Duncan. Look for evidence of Notan in Georgia O'Keeffe's work. * The Romare Bearden Foundation - and excellent source! 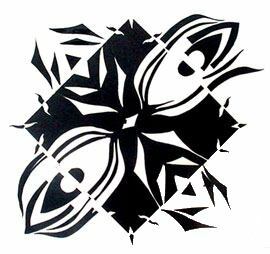 "Notan" is the ancient Japanese art form that uses positive and negative space. Cedar Creek art students studied these techniques before creating these amazing designs. Sharp Scissors are needed. Bunki Kramer suggests that you have some tweezers handy for the kids as it's very tedious to glue small pieces (Bunki's student work was more intricate that the work above). Book - Principles of Pattern Design - Illustrations depict repeating patterns using these shapes: square, brick and half-drop, diamond, triangle, ogee, hexagon, scale, and circle. Eye-catching pattern samples are also included from textiles, macrame and embroidery, wrapping paper, mosaics, painting, collage, sculpture. 3. Using ideas, simplified from your work with Notan activities done earlier, but without such tight limits, make an ATHROPOMORPHIC MASK with some movable parts. You can find more examples by entering Notan in a Google image search. If I remember my "History of Art Education" correctly, Notan was featured in Art Education text books written by Wesley Dow which were studied and used by Georgia O'Keeffe in her days as an art teacher in Texas. History does repeat itself. 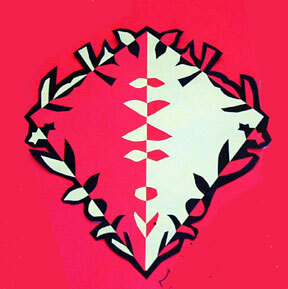 I would also suggest that teachers interested in Notan check out Chinese paper cutting and the Polish art of Wycinanki. Notan is a Japanese word that means "lightness-darkness." It represents one of the basic principles that help compositions stick to the wall. Notan has nothing to do with local or chosen colour. It's the ability to see things in terms of black and white, and to consequently build strength in imagery. When compositions work in black and white--they work. Whether they put a name to it or not, artists in all cultures have long recognized the value of notan. Devices have been invented to look for and find it. The "Claude glass" is a convex, black glass used to reflect a landscape in a reduced size with muted colours and less detail. The French painter Claude Lorraine (1600-1683) is thought to have invented it. While the odd one is still seen among "plein air" painters, the more common approach is to view work with half-closed eyes--or to get way back. Another system is to view art and subjects through generally blue or green camera filters or gels. But more than anything notan is a learned skill. For those of us who struggle daily at the painting game--the enemy is "wishy-washy," and the desired object is to yin and yang with the viewer's sensibilities. In the words of Junichiro Tanizaki: "Find beauty not only in the thing itself but in the pattern of the shadows, the light and dark which that thing provides." There are two types of Wotan - planned notan and developmental notan. Planned notan is often figured out in a preparatory sketch, or is "ready made" in the subject matter. Developmental notan is where you find Wotan - indeed you make Wotan - as you go along. 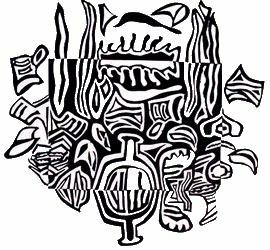 Notan is also a matter of degree--it can be a strong, interactive pattern with negative and positive, even an eye-fooling optical illusion. In abstract work the job of finding notan can be the main joy and source of magic. In more realistic work it can be a skittish but nevertheless satisfying pattern discovered and built during the process. Tuned-in artists find themselves saying: "This is good notan." An exercise that never hurt anybody is to simply plan and calculate good notan into a work--then make sure it stays put. (c) Copyright 2004 Robert Genn. (reprinted here with permission). Use any color of Construction Paper - square or rectangle. This lesson begins much the same way as "expanding the square". Student use stylized letters for the name. Break up letters with more lines. Cut letters with scissors or X-acto knives. Mount background square on contrasting paper. Fold some shapes back and secure with glue. Bend some shapes up and secure with glue to create a 3-D effect.